Day 5 is my last day at the tournament and the weather was again frightful! The trees were swaying in the breeze and the dark overcasty clouds gave very little hope that play would start. But as all tournaments do, play began and the first match to start and end was the Nicholas Santos matcch. The #1 seed was taking on Brennan Boyajian (right) the American qualifier and it was no walk in the park … for Brennan. It wasn't until the 2nd set that Brennan was able to win a game and that was about it. Nicholas has been making his way through the draw with little fanfare, but should have a his hands full with Peter Polansky, the Canadian who first upset Kellen Damico and in the quarters took it to Pavel Chekhov and won in 3 sets: 6-7(7), 6-1,6-4. He does not seem ready to go away! The women's quaterfinals were very long, very arduous and very emotionally and physically taxing. Madison Brengle and Ksenia Milivskya had the seeming easiest time. But only because one opponent injured herself and the other lost in two sets. Other than that, they were just as hard fought as the other 2 matches. Brengle was actually down in the 3rd set 1-0 when a freak accident happened and Petra Martic somehow terribly twisted her ankle. After receicing treatment for it, she sould not resume and madison progressed to the semi finals. Milivskaya took on fellow eastern European Urzusla Pivovarova and the score was a close 6-3,7-6(8). But Milivskaya did what she does best: win that last point! The last 2 Americans in the draw were not so lucky: in the "moon ball verses the drop shot" contest of Rika Zslinszka and Sharon Fichman, Fichman's drop shots were ultimately more effective and she pulled out the match 3-6, 6-4, 6-2. On the court in front of them, the war between Julia Cohen and Nikola Hoffmanova raged on. There were 2 trainers called, lots of long tactical point and many breaks. It seemed that Julia had the upper hand getting the break to 5-3 in the 3rd and serving. But rain started falling and starts and stops to the match began. After all the tumultuous activity on the court, Hoffmanova pulled off the upset 6-4,4-6,7-5. I would have loved the weather not to have played a part in the final score, but how do you fight Mother Nature?! The girl's 16 finals will crown an American winner as Allie Will and Lauren Embree take on each other for the coveted Orange Bowl title! Who says American tennis is dead?!?!!? While Donald Young had an easy day at the office in his singles match, the same could not be said for him in doubles. He and his partner Kellen Damico who on paper were the team to beat, came out firing against Eddie Herr finalists Dennis Lajola and Roberto Maytin and won the 1st set 6-2. But it's difficult to keep up that lever and Dennis and Roberto started working together as a well oiled machine and by the last point of the 3rd set, the international duo took out the #2 seeds 2-6,6-4,6-3. He said he's "broken the doubles curse" and I wish them all the luck in the draw! I am on my way back to Atlanta to continue editing of the documentary and I want to thank you all for reading my repoerts and hopefully enjoying them as much as I enjoyed watching the matches and writing them. Best to all! It's day four at the Orange Bowl and it was a very busy one. The sun was the same, the courts were the same, but there wasn't one match that was like another. That's what makes this tournament so special. I got to the park in time for the first break at the Julia Cohen/Melanie Oudin match. But with these to very talented returners I knew it wouldn't last forever. And it didn't. Julia went down 2-0, but in typical Julia fashion, she broke right back to level the match at 2-1. It was the battle of the "come on"'s. It didn't matter whether they lost a point or won a point, each player would yell "come on" to spur themselves on. And it always helped. I've noticed that Julia has gotten a bit more aggressive and I think that the last month playing the ITF Pro tournaments in Mexico has made a great difference in her game. But this means nothing to Melanie who has the composure of someone five years her senior. The points were terrific, hard fought and tense. You really never knew who had the momentuum until the last point of every game. And in the 1st set it was Julia, 6-4. The second set went very much the same with Julia breaking to go up 5-4 and held at love. That showed the focus she has this tournament! It is great to see. I walked between the Cohen and the Madison Brengle/Ksenia Pervak match, which had very little suspense until the 5-2 game where Pervak fought off two set points. In the next game Madison had a 3rd, 4th and 5th set point before she was able to prevail 6-3 with forehand rippage down the line. The next set went very quickly at 6-1. Madison next takes on Petra Martek who was a quartfinalist at the US Open. Then I went in search of the Wil Spencer/Bassam Beidas match. Having been so impressed with his first two rounds, I thought this would be another war of attrition. And I was right. Bassam won the first set, Wil won the second set 7-6, 7 points to 0. Beidas as he did against Klahn in the first round seemed ready to go gentle into the dark night but then started to get very animated in that Brengle way. Anyone who says personality is missing in tennis has never seen either of these players play! Beidas, after yelling half John McEnroe half Jerry Seinfield "I get a bad call and I snap and that is why I lose" went on to win the 6-1 in the 3rd. Kudos to Spencer for a great match and a great tournament, but sometimes that last point is just not there. The other matches were pretty standard: Milevskaya beat Mallory Burdette, 6-1,6-1 and Reka Zslinzska upset Katerina Vankova. Donald Young won, as did Peter Polansky, Nicholas Santos and qualifier Brenann Boyijian. It's always great to see a qualifier into the quarterfinals, but now he comes up against #1 Seed Nicholas so there is much to be learned tomorrow. I think he's ready. And as I did the last two days, I went to see the wonderful Allie (I've spelled it wrong up until now so I apologize) Will take on #7 Charlotte Rodier, the most amazingly in shape 15 year old I have ever seen. Everyone should have her trainer! Very little separated these two warriors who could throw in a hard high looper as easily as slug a forehand inside out winner. Add great net games and excellent court sense and you have a 2 hour and 45 minute 6-4,3-6,6-4 win for Allie. There are so many superlatives to be said for each player and it was one of those matches where you almost don't want to see a player lose. Because with this level of play, no one did. Tomorrow is more than likely my last day here, so one more report will be coming. Thanks for letting me be apart of this tournament and to bring it to you all! It's been a blast! The clouds rolled out from last night and it was typical south Florida weather. Although they said 81 high, it was easily 93 in the sun. And the tennis on the court was even hotter! Even I had to put my camera down to cheer on some great Americans. It was a very busy day so please bear with me as I try to recap as much as I can! The first match I saw was the last game of the girls 16's match with Ally Will of the US taking on the #1 seed Valeria Solovieva. The game was fraught with hard hit loopers that ended with Will taking the match in straight sets 6-2,6-4. She spent very little time celebreating as she had to go to one of her two jobs: dog walking. It pays for the fitness coach and from the last two wins it's all paying off. The next match I watched was Wil Spencer who knocked off the #6 seed in the 1st round. So many times there's a let down after beating such a higher ranked opponent, but not this time. Wil, coming off torn ligaments in his ankle and physical therapy, came out against Ivan Endara and it looked like a classic clay court match. Every rally seemed more suited to the red clay of the French Open than the hard courts of the Orange Bowl. Within the first 4 games there was a code violation, a ball hit out of the court, a break of serve and several "Vamos." I'm beginning to feel bilingual. Will prevailed 6-3,6-4. Next on the same court was #2 seed and #4 player in the world Ksenia Milevskaya against Kim Couts. The last time they played was on clay in Brussles and the score was a very comfortable 6-2,6-1 for Milevskaya. And it looked to go very much the same after a series of well placed and timed drop shots that kept Kim off balance to a 6-1 1st set loss. But Kim regrouped in the 2nd and came out firing, playing two amazing games to go up a break. Milevskaya did the same exact thing to get even at 2-2. Each player held serve until 5-6 when with great focus and some very deep, hard groundstrokes Kim had her 1st set point, but it was not to be. After fighting off another set point, Milevskaya held to force it to a tiebreaker. Milevskaya did what she does best: force her opponent to beat her and Kim came up short 7 points to 3. It was one of the best quality sets I've seen this Orange Bowl and both players should be proud of themselves. On the court next to Kim was her doubles partner Madison Brengle who was having an easier time with fellow American Gail Brodsky. Although the points were long and Madison was as animated as always, the score was a 6-3,6-0 decision. Later in the evening, Kim took on Milevskaya again in doubles. Madison and Kim had beaten the team of Milevskaya and Bohush last week at Eddie Herr, and it looked to go the same after winning the first set 6-4. But serving at 4-5, Kim was broken and they ended up losing 4-6,6-4,6-1. Fourth seed Julia Cohen took on fellow WTA Tour rising star Ashley Weinhold and the score was for Julia, 6-3,6-3. Ashley did have great success today in a doubles win with Alexa Glatch, 6-1, 6-0. Next up for them: the #1 seeded team of Sharon Fichman and Katerina Vankova. 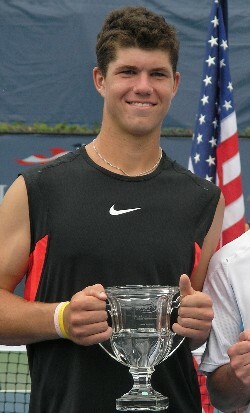 Other winners were Melanie Oudin, Mallory Burdette, Brennan Boyajian and Donald Young. In a tough, tense, see saw match against young Americans Mateusz Kecki beat Chase Buchannan 6-2,1-6,6-4. Oh and Dennis Lajola came back to win his doubles match as the #5 seed with Roberto Maytin. WOO HOO! Tomorrow is another day and that means it will be hot in Miami. Day 2 of the 60th annual Orange Bowl was not without its charms or annoyances. Today started with the Girls 18’s up at 8am. No one I talked with was excited about this. And rightfully so, since as everyone started filling into Crandon Park they woefully realized the courts were still wet from the evening before. The first match did not go on until 8:30am and threw the entire day out of wack. The first thing that happened was the always impressive Melanie Oudin took her amazingly solid game to court 12 and directly at Elena Chernyakova, the #15 seed. I don’t know if it was the rain or Melanie, or a mixture of the two, but who would have predicted the wildcard from Marietta, GA would win 6-1, 6-2? Madison Brengle and Kim Couts, together the #7 seed in doubles, each had workwomanlike wins. Kim played Andrea Weedon from Guatamala, and it was quick. 6-1, 6-1 was the final score and it was one of the most methodical picking aparts I have seen so far. Madison was having her own field day with British qualifier Anna Fitzpatrick. It wasn’t quite as methodical a drubbing as her partner’s, but she felt comfortable enough to ask for a moment after hitting a forhand winner while acccidentaly pulling out her pony tail. Oh, to be that young and confident! They then teamed at the end of the night to overcome 2 rain delays to win their 1st round doubles match 7-6(6),6-2 against a very tough team in Veronica Li and Kai Chen Chang. Rain may make flowers grow, but it makes tennis players very cranky! I don’t know the score, but Nick Saviano told me when I asked if his student Mallory Burdette won and he said “yes!” That would have been against the #14 seed Valeria Pulido Valesco. Other Americans who had great days today were the #4 seed Julia Cohen who hit every looping forehand and every flat backhand down the line to a very routine 6-4,6-0 win over Mary Alice Grajdek of Germany, Gale Brodsky, Kristy Frilling, qualifier Chelsea Preeg and Ashley Weinhold. And on the Weinhold front, she is the #6 seed in the doubles with a familiar name on the USTA Pro circuit, Alexa Glatch. I think they lost a total of 2 games and maybe 17 points. It wasn’t pretty for the other team. On the Boy’s 18 front there were oddities to be had on almost every court. #3 seed Kellen Damico forfieted his match against Peter Polansky of Canada after being down 6-2, 2-0 due to illness. Former doubles partner Nate Schnugg (pictured left)lost, not in a retire, but in two sets to qualifier Brennan Boyajian 6-3, 7-6(3) and #13 seed Dennis Lajola not fully recovered from his injury went down to a very vocal Fernando Romboli from Brazil. I have never heard so many “Vamos”’s come out of anyone’s mouth as I did today. Or ever that LOUD! WC Bradley Klanh had the #9th seed from Lebanon Bassam Beidas on the ropes up 6-3, 3-2 and a break to lost it 6-3 in the third set. I hear Beidas yell “You know what you have to do!” And he did. I only saw one girl’s 16 match and that was a tough one: statuesque Ally Will took on the even taller Brit Naomi Broady. Ally came back from 2-1 down a break to win the 1st set 6-2, lost the 2nd 6-1, and with ever moonball and sliced backhand took the final set 6-3. I was amazingly impressed to actually see a girl hit a drop shot and follow it in. Was ever more than amazingly impressed when she did it a 3rd and 4th time! Tomorrow is another day and should be very exciting! I will bring you what I can when I’m not working on the documentary! It's the start of the 6th Anniversary Orange Bowl in Key Biscayne, Florida and it's started with a bang not a whimper. The girls #1 seed and #3 player in the world, Ayumi Morita, was One to watch on the USTA.com Orange Bowl preview page and has been on a great winning streak that is, until today. Playing the 4th match on court 1, Morita was out of sorts in the first set against Kai-Chen Chang and as she did against Kim Couts in the US Open 1st round lost the 1st set 6-2. But unlike that match where with every game and ever flat down the line backhand she was able to wear her opponent down physically and mentally, she stayed out of sorts and lost the 2nd set in a tie-breaker 7-3. What that did was open the draw open for #2 seed Ksenia Milesvkaya, who had her hands full with wild card American Jamie Hampton (right) who had a successful, aggressive and error free 2nd set, but fell to the Belarusian 6-4, 2-6, 6-0. This shows the great depth in this particual Orange Bowl Field. On the boys side, there was only one major upset: another wc entry, Wil Spencer, made the most of his draw position by beating the #6 seed Roman Jebvay in a long, hard hit match 4-6, 6-4, 7-5. Wil went down an early break in the first set and so many times players in first round matches will just roll over against a higly ranked seeded player but Wil didnt. He started getting a little stronger on his forehand and refused to be overpowered by the Czech. Also, 17 y/o professional Donald Young, the #2 seed, won in easy fashion 6-2, 6-3. Other American winners in the 1st round were Asia Muhammmad, Jamere Jenkins, McCall Jones and Austin Krajicek. Tomorrow most of the bigger name players begin their assault on Crandon Park for the title of 2006 Orange Bowl Winner! Great luck to them all.